The chief executive officer is the important role in the management of an organization. Is he also the most important when companies implementing the Toyota Production System in their work? The CEO, as well as all members of the leadership team, have vital roles of play in the success of Lean in their companies. Middle and lower level managers can implement Lean ideas in to their areas, and have short term success. But eventually all aspects of the business must be involved. The top leadership has the vital role of setting the path forward, the vision. It is this vision, be it 1, 5 or even 10 yrs forward, that drives the activities of everyone in a lean organization. In Lean we call it Hoshin Kanri or Policy Deployment. Could you give some tips for CEO? For example five must-do steps. -Be patient, results don’t happen overnight when implementing lean. The purpose of TPS (Lean) is to identify waste (from the customers view point) and eliminate it, to expose problems so they can be solved. Thus it is a system that has the capability of developing employees like nothing else can. Improved financial results are the result of Lean, not the purpose. -Go and See. No matter how high you get in the organization take the time to go to the “floor”. The floor is where ever in your company that team members product the service or product that your customers want. Go and learn and teach. It will be invaluable to both you and the team members. -Think long term. Don’t use lean as a way to cut jobs. -Get a Lean assessment, have someone skilled in Lean to look at your company from an outside perspective to see where your greatest opportunities are located. What are the biggest and most common mistakes CEO make when implementing the Toyota Production System? -The biggest mistake companies make is treating lean as a Tool kit. It is not a tool kit, it has many tools that are useful but the existence of a few Lean tools does not mean you are a lean company. -Results over process, may leaders focus on results ahead of process. In lean we must balance this view. If a result is achieved and you don’t know how it was achieved then that is called being Lucky (or unlucky if we don’t like the result). In a Lean system we must know how we achieved the result, we must know the process so we can learn from the result and continually improve. -Impatience. As stated before, it takes time and discipline to develop a smooth running lean system. How about employee? A small number will quickly understand it. A small number will feel threatened and try to kill it. Everyone else waiting to see who wins. How CEO should motivate workers? We must all understand that we are working in a global economy and whatever our product or service we must be competitive. Team Members must understand this and know that long term job stability depends on our company being able to compete. No longer can we hope to be shielded from this reality. If your company doesn’t adopt Lean practices then some other company will and they will have highest quality, lowest cost and shortest lead time and you will be at a disadvantage. Knowing this we must teach our people about lean, train them to see waste and how to eliminate it. Waste makes up 99% of the time in producing a product, from raw materials to market. There is so much opportunity to get team members involved. Leaders can also put in systems to reward the people who contribute ideas to the company. Kaizen Teian is our term for the idea of everyday improvement and implementation. This is vital to motivating team members. They must also know that Lean is not intended as a way to eliminate them, on the contrary, a company may need more people to fill the orders that result from being more competitive. I find few sentences about it. For example: “Traditional organizational structure hides problems.” Value streams look at the organization horizontally, not vertically”. Why is it important? At its core lean is about people raising and solving problems. Even the afore mentioned Hoshin Kanri process looks to understand the problems of tomorrow and work to solve them proactively. If Problem Solving is our main job them we must structure work in a way to make problems visible. Many times in a traditional company structure each area has its responsibility but we don’t connect in a way that ensures problems are visible across many divisions, across the entire value chain. We must have the courage and humility to raise problems and solve them. If not some other company will and we may be left behind. There is so much more to say about problem solving. The benefits of the “lean” production for business and industry are obvious. What would you say about other types of organisations – state institutions? Anytime you have a customer and a process lean is right for you. I say this with a bit of humor but it is true. Lean looks for waste from the customer perspective and more specifically we say that the next process is your customer. In this scenario we must them deliver value to whoever gets what we produce internally or externally. When we do this the end user of the product or service gets what they want. That is the goal of not only manufacturing but any company or government agency. One of my biggest clients is a Mortgage Bank that services Government programs. We have worked with them for quite some time to redesign processes to deliver their service to their customer at the highest quality, lowest cost and shortest lead time. Can you briefly tell about implementing the Toyota Production System in Washington? How state government try to change its working style? -State government is embracing lean for the same reasons as manufacturing clients and the Mortgage Bank. They want to do a better job of delivering service and do so within a shrinking state budget. They must continue learning how waste has been built into their work processes and how this waste does not serve the customer. We have worked with an Agency in the State government and are seeing decreased cost and increased quality as a result of Lean activity. Many people think that Lean is only for Japanese companies or just Toyota. We have seen lean transform companies and agencies across the world. Mars Lietuva is an example of how Lean can work in this country. They are part of a Global company that has embraced lean from South America, to Europe. We have found no company or country culture that is against finding ways to improve. There are some individuals that are afraid and resist Lean but this is not cultural, it is personal. You have been in Lithuania, in “Mars Lietuva”. What cultural differences do you notice here? Mars Lietuva is doing a great job implementing lean. They are seeing results that they would not have seen without Lean and the people seem to be embracing it. One thing I see is that Lithuanians seem to be very positive so it makes it a bit more difficult to also see the problems. Mars Lithuania is a great example of people seeing problems as a positive! This may not be natural but they are seeing that we must find our problems and solve them (even with a smile). Yes problems and the solving of them is quite positive! Interest in Lean Thinking continues to grow. Why doesn’t everyone Do “Lean”? -Because they are not patient. Only great leaders develop the type of vision necessary to implement Lean and then have the discipline and commitment to let it work for the long term. Many will give up and move on to the next thing. It is not easy, the concepts are easy but actually implementing and having the discipline to see it through it difficult. It is not for the weak. 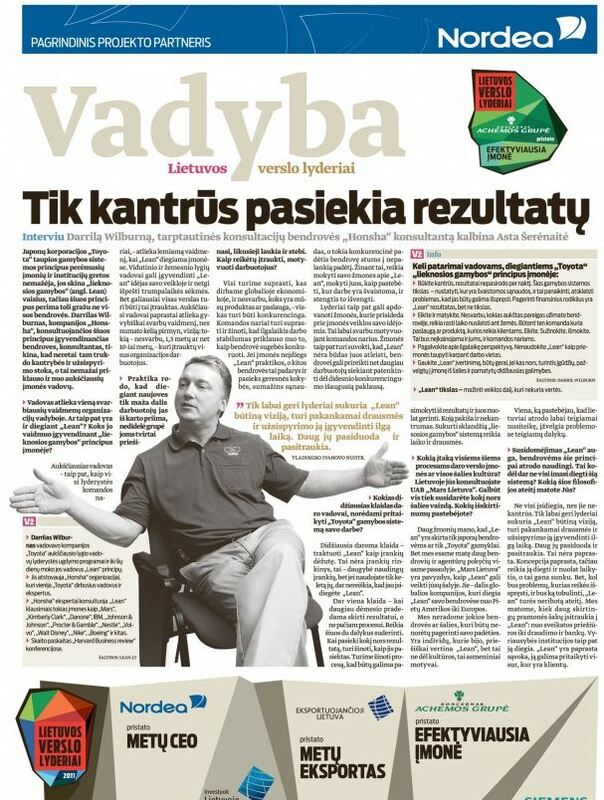 Lithuania is seeing a growing interest in Lean, not only do you have successful companies implementing Lean you also have support in companies like Lean.lt. It is an exciting time to be part of Lean in Lithuania. What Future do you see for LEAN? -As long as there are problem to solve and improvements to make then Lean will have an unlimited future. We are seeing so many different industries involved with lean, from Health Care to Insurance and Banking. Government Agencies are also leading this next wave of interest. Lean is simple in concept so it is easy to apply to any situation that involves a customer. If your company is suffering because of the global financial situation then Lean can be helpful. If your company is in good financial condition then Lean can help you prepare for when times are not as good. We were taught at Toyota that “When times are good we prepare for when times are bad. When times are bad we prepare for when times are good.” This is what Honsha helps instill in companies.